Campaigners camped outside the Scottish Parliament have been served with a fresh legal notice to quit the site. The Parliament won permission at the Court of Session to serve action on the IndyCamp Live group, who aim to remain in place until Scotland is independent. The campaigners now have 21 days to respond to the parliament's claim for recovery of possession of the land. The group declined to comment on the latest development, but has previously insisted it would not be leaving. 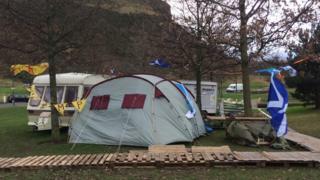 Tents were pitched at the end of November, with campers taking inspiration from the Democracy for Scotland vigil which campaigned for Scottish devolution in the 1990s. They plan to keep the camp occupied full-time until Scottish independence from the UK is declared. The Scottish Parliament has launched legal action against the group, saying they are preventing other members of the public from using the public space. The parliament also contends that the presence of the group is at "odds with the policy of maintaining the political neutrality of the parliamentary estate". A spokesman said: "We recognise the importance of peaceful protests in a democratic society. "However, by seeking to occupy this land on a long term basis, and refusing our request to vacate, we have had no alternative but to commence legal proceedings to return the land to wider public use." Leaders at the camp said they would not be commenting to the media until they have installed cameras at the site to record any interactions.